In the last few sessions I have mentioned that i had been in contact with St Stephens shopping centre in Hull with intentions of securing the group with a opportunity to showcase our client project’s current stage before our hand ins. After several days of contact and acquiring the necessary documentation (public liability insurance) from Hull College I had us booked in for Friday 15th May from 10am-4pm. With this secured the client session before the showcase as team leaders we sat down and emphasised focus on promotional materials, this had been tasked a few weeks before hand but little progress had been made to our understanding. When it came to Thursday the day before the showcase and no evidence of a leaflet or any other promotional materials had been presented we took to informing the tutors on our current issue, to resolve this Gareth stepped in to help us design and piece together some promotional materials. To assist Gareth I went through any files i had that i thought could show the public our design process over the year of work. This included Concept art, renders, screenshots of 3ds max progress, sketches, research wall photos, designs, ideas, group meeting photography, and other helpful images. After collecting work of my own I had asked other students in the studio if there was anything of use they feel they could put into these folders allowing Gareth to have a pick of the bunch. James put in some concepts/research and Viktor put in some step to step and final production of sculpts and his bank. Phil also gave Gareth some seperate renders which was used for the leaflet designs including the 3D version of my signpost logo sketch. Many people liked the signpost logo with the Old Town Memories font in the style of the street signs currently in the street which was there in the 60’s so it had accuracy and relevance to the project. To try get different perspectives and cleaner visuals of the logo Phil decided to take the basic street signpost logo into 3DSMax and I took the street signpost with the lantern into 3dsmax. With this i felt that it was decent but the logo design in realistic 3D didnt work for me it just didn’t feel right. The next step for this would be to take it into Photoshop and overlay correct type of the street font then add colour, or texture it to create the same effect. With limited time I left this to Phil to progress on his logo whilst I contacted St Stephens about transport of the television to our display area and sign in requirements for the group. Due to St Stephens fantastic customer service the reply was very swift and we cleared any possible issues for the showcase. Information- give informative replies to any questions in a polite and controlled manner. Do not over explain any technical terms to the project but also dont be condescending towards the public treating them like they know nothing. for example instead of talking in depth about the process of 3D modelling and using modifiers to shape a certain complex shape which will be later unwrapped using the uvw unwrap to take into Photoshop, ndo2 or other programs, simply say to create the models of the buildings and assets you see we use 3d software which allows us to place them in the game world (engine) as you see them now. Its not over informative but its also not too complex just to the point and well explained. Let them know that this is a working progress and to keep an eye out by taking a leaflet as we will be doing the final product display in September. Clothing- Dress smart or smart casual, you want to be approachable and presentable. We are representing our course and college so it is important to give ourselves and them a good image. My personal attire was a suit blazer with polo and jeans. Layout- The project is in the middle of a shopping centre with many people walking by to draw them in we need to have a well laid out station with regards to promotional materials and availability for them to be seen and picked up easily. The layout I placed 3 leaflets overlapping each other to add a personal touch to the space and then we had plastic holders for the leaflets placed on the stand in front of the TV but not obstructing the view of the video. Video- The main piece we want the public to see is the video which is a fly through of the project. With help from Gareth he pieced together using our content and previous video a professional informative video for the public to view. Presence- Using our shifts each person had to man the project with another colleague, our time around the project was there to draw people in. But in the times where little interest was given we must ensure that we do not obstruct either the view of the project stall or the public’s path. The general position of one man at each side of the TV was assumed by most groups. Another thing with this is posture, to be standing upright and approachable, this means no slouching or leaning or hands in pockets as it just doesn’t portray the right image. We need to look as enthusiastic and professional as possible around the project so that the public might be interesting in taking a look. Teamwork- Due to our idea to have shifts for teams of 2 at each interval we need to communicate between each other on overlaps. This means when handing over to another group to inform them of any interests in your shift, what to do with the documentations and forms if somebody wants them, handing out of leaflets, and any issues that have been raised throughout the day. If any problems arise the scheduled rota’s for each team was on the sheet along with contact details so people could come help. There are other things but them 3 I believe are key for us to be successful at our first public showcase of the project. On the day of the showcase Myself and Phil was first on the list, due to my contact with St Stephens I was in charge of signing us in, finding out our location and then setting up (Phil set up too). Also I made sure that as its a public place and St Stephens usually prohibit photography in the centre that we was alright to take photos of us and our stall to add visuals to our evaluations of the day, this was confirmed fine by the staff. Once set up it was around 9pm but the requirement was to be set up by 10pm so earlier we set up the better and we could get started. Barrie also brought us down some freshly cut doorstops as we had a wheeled TV stand and St Stephens is on a slope, so just for safety precautions we felt this was a necessary to have done. Immediately we could notice that earlier on we might not have much interest, people was on the way to work, getting breakfast and so on. There was time for a quick glance but not many stopped to talk to us, this we felt was natural with it being earlier on and expectations for more viewers would come later on in the day dinner time onwards. Our people skills generally improved over the time as first we didn’t want to bother anyone as we personally know how frustrating it is when your going somewhere and people try stop you in the street, but we realised this is for the project so anyone slightly tempted is a bonus as then the public can give us their thoughts. Yet despite rejection and disinterest from people walking on past we needed to show our professionalism by keeping a calm level head about it all to try get others in. I had an idea to employ Skinner’s operant conditioning into our showcase, i went to Tesco and purchased some sweets to place behind the promotional material, if the public came and talked to us or viewed the project they would be offered a sweet as positive reinforcement for supporting our work. Just a little touch but employing game theory into our client showcase was an interesting method to test. In my first shift with Phil we had 9 people come see us 6 being people from the course but still wanting to know how its all going and what we have done. One of the other 3 was a lady from Historic England and she was extremely interested in the project as it was quite convenient she had just come from a meeting about heritage projects and just so happened to run into us which was great. After explaining our work we exchanged details for contact for further information and a potential future client, she mentioned about our impressive 3D work and how they could use it for 3D visuals of building design planning before the real builds. This was really great for us as we sold the project so well to her Stephen was also with us as it was the beginning of his shift and helped explain everything to her. She walked away impressed and enthusiastic which gave us a great confidence boost and vibe about the work and the benefits of the public showcase. After our shift the only issue that was raised was from Abbiella, upon coming to check up on the group see how things were going and give a bit of advice she had been told by the previous group not to take any photographs at all. After visiting the staff as i said before this was cleared up and use of photos was perfectly alright for our own personal use. With me previously posting an image to Facebook to let my friends and family know of our presence in the shopping centre I decided to try take it to the next level. Not many of the leaflets had been taken which suggested at nearly 3pm loads of people hadn’t come and spoke to the other groups. With that in mind we have them as hand outs, so I decided to go into GAME to ask if I could leave a couple on the counter to get people to maybe notice we are games designers and not a charity like most of the other stalls. GAME kindly accepted to leave them there and actually offered to tweet that we was there as well, which was brilliant and also a shame as I had only thought of doing it 1 hour before we packed up. But we know for next time that potential nearby stores might be worth placing a few temporary promotional materials in just to try attract anyone who may have missed it. With 1 hour left James decided to stay behind after his shift into mine and Phil’s second shift to help out, with the extra man we sent James to the front of St Stephens with the majority of the remainder of the promotional material to hand out to passing people informing them of who we are. This attracted a few in but with saying the final showcase was in September maybe people wasn’t as interested until the final product. Nevertheless personally as the day went on confidence grew and more ways for developed to try bring people in which we can take into any future showcases of the project. It was time to pack everything up so Paul came down prior to 4pm to check up on us, then Me, Phil and Paul packed all the equipment away and put the TV back in Paul’s car to be taken back to the studio. With the day coming to an end I decided to go thank the St Stephens staff for all there help with our showcase in the day and i also sent them an email when i got home to once again thank them and notify them on how this has benefited us as students. I will also type up an email to John Netherwood sometime next week to thank him for allowing us the use of the TV and stand for the project. To evaluate the day I have to say that as a team I believe we did a great job in all professional aspects especially presentation. The best thing we can do from St Stephens is to treat it as a stepping stone, for the next showcases we will have further progress in the project, better promotional material, better people skills through the experience and understanding of our surroundings. The day itself is just the first in a run in to the final showcase on September, but the more we can do and practice then the more effective and professional we will be when it comes to that stage. Allowing the public to see the project at its current stage which we was hoping to be alot further and still see the amazement of how we do what we do and praise for our work is a real boost for us to push this as much as possible into September to really impress people, hopefully anyone who obtained a leaflet or information from us will see us again on our next showcases to see the progression and keep an interest in our work. We also need to set up at least a blog or a official website as people did ask for this as none of the online presence was on the leaflets which was a mistake on our behalf only contact information, so we could only direct them to Facebook, Twitter or YouTube which honestly haven’t been used to the full potential so for future we need a working website. What we hope to have for next time or prospect centre when that is confirmed is the interactivity side of the project fully underway, we have 3 TV’s at our disposal so the set up with one of the professional video fly through we had in St Stephens, then another similar style to where we are now and then the interactive version would be a great way to display our work. On the day we felt that from our experience with “Rush n Crush” that me and Phil noticed people were more inclined to pick up and play rather than watch, yet that might not be everyone’s preference so different set ups one being more visual and informative and the other playable would attract a wider audience. As for the sweet and employing operant conditioning, not everyone wanted one but they seemed pleased to have the offer there. Overall a very good day and I would like to congratulate the team for all their efforts for people who attended hopefully we can take this into future showcases. With time now before the next one we can edit this version that Gareth pieced together watch it make notes of what works and what doesn’t to improve on what we already have. Categories: Client Project, Year 2 | Tags: Client, Communication, Design, Design Process, Event, feedback, Group, Layout, online presence, Professionalism, progress, Project, Public, research, Set up, Showcase, Social network, St Stephens, Team, Video, Video game | Permalink. With the recent contact with St Stephens over publicly showcasing the client project I bumped into “Public Liability Insurance”, St Stephens required this to allow us to showcase the work. Now as a student I was unaware of the importance and requirement of this to display in a public place, so i decided to look into it to give me a better future understanding for any projects I or my group my showcase. So what does public liability insurance cover, exactly? You’ll find that your insurance policy covers a vast range of situations, but generally speaking, a public liability insurance policy covers your business if someone is injured in some way by your business, or if you damage third party property when carrying out work. Bear in mind that even a minor scratch to personal property could lead to hefty fines, especially as you could be required to pay legal fees if the case goes to court, and these too will be covered by your policy. When taking out public liability insurance, you need to tell your insurer what type of business you operate. This is not just for the sake of records, but will help you come to an agreement over the type of policy best suited to you – whether your insurer judges cover up to £1 million to be sufficient for your needs or if a larger policy of around £5 million would be more appropriate in the circumstances. If you work in the public sector, for example, you will often be required to take out a minimum of £5 million. This is quite an important insurance to have it seems, if we was to go to St Stephens and did not have this insurance and something was to happen the business we are working for (Hull School of Art and Design) would potentially get heavy fines which could lead to more fines if the case goes to court as then you have to pay legal fees. In connection to us public liability insurance is clearly something we should and do have, I imagine for St Stephens if we didn’t have this insurance we would have been unable to showcase the product as partial liability would fall to them as they are accommodating us. Categories: Client Project, Year 2 | Tags: Client, context, cover, Event, insurance, PHASEgaming, Professionalism, progress, Project, Public, research | Permalink. On the return of Easter as group leaders we was hoping to see our teams work over the holidays towards the project. Unfortunately when asked the majority of the group had focused on their self initiated projects instead of the client, this was quite disappointing as everyone was set targets and agreed to them before Easter. Nevertheless we proceeded with the group meeting after I stated to the group that we all agreed on a target and seen as myself and Phil was pulled from the project due to doing too much work on it and not enough on the rest of our work it was down to the rest to produce work. With that all being said we had estimated we have around 6 weeks left due to no pinned down hand in dates, due to this we all agreed that to have a 2 week clean up period before the final hand in was a sensible action to take. This would mean we have 4 weeks to finish everything outstanding for every individual in the group, then those 2 weeks would be spent checking all the work for errors, bug testing the engine, and then correcting any errors that existed. This would be a similar procedure than what would be taken in industry, before a game would be shipped everything would be checked, checked again and checked again really. The final product is the key and will be on view to the public for example we don’t want to be explaining why that car is floating above a building its unprofessional and with this 2 week clean up period this should eradicate any issues. Before Easter in the last session we had been trying to come up with a name for the project (see link for design process of name), with many being generated and one not particularly pinned down we decided to leave it until after Easter to decide on a name, this allowed anyone to have a think and possibly come up with a name for the project. With that being said we finally decided on my idea of “Old Town Memories”. I particularly liked the name because it had a soft ring to it, also it directly linked to our project with us designing a section of Old Town and with it being the 1960’s and most people will still be around from that time period remembering what it was like it would spark memories. With the named being decided on the design documents for the public eye needed to be done. This would include things such as leaflets/flyers, concept booklet, logo/banner, and a bio of the project. This would be a general input from the entire group as the more input the better. My personal input was that we need a theme to it, a general style for each document which replicates over the other documents gives a professional look to it all. As for style i suggested as I did to David with the UI/HUD elements to research into fashion colour trends on the time period to try link it all in. Closing the group meeting I emphasised the importance of communication, we need to talk people cannot be at any point in the dark now, if there are any struggles from any individual they need to be open about it so somebody can help to progress them further or take the work from them so its completed. Its crunch time and teamwork needs to be a priority. Moving on, in-between session 20 and 21 we had a surprise meeting with our actual client John Netherwood the chairman of the Hull Civic Society. The required myself and Phil to take the meeting and introduce ourselves, our work and what we have done with the project. To have a quick and efficient way of showing the project instead of having them playing it, Phil made a matinee sequence which made a fly around of the project disabling all player controller input. Mr Netherwood arrived with his wife to see the project, myself and Phil proceeded to shake hands and take the meeting in a professional manner. We discussed current progress, features and our passion towards showing this to the public. Which we was confirmed with a venue of the History centre alongside the fashion students 1960’s project. Also a near certain of Hull’s transport museum in September when the Hull Heritage week is on. Then any other possible venues we would need to seek out ourselves which we had planned to do in the next session. We are also going to try contact the Hull Daily Mail to do a article on our work at its current stage and then a follow up of where it will be by the time the Heritage week comes around. Overall myself and Phil was very pleased with how the meeting went, we stayed professional and happily had a back and forward conversations from questions posed from the client. Discussed what they would like to see from the project and so on, it was a really beneficial meeting for myself it allowed myself to gain confidence in talking to potential clients as we was naturally nervous about what they would think. They also liked the name of the project which was pleasing as we had trouble pinning one down initially so all positives came out of the meeting which was great for us. Moving onto session 21 which will continue into Thursday as we presented all of our work since Easter on Thursday including the client work. Initially in the session we had a brief catch up on what work has been done since last week, this week we had a full group which we didn’t the previous week so everyone was caught up. After that Myself, Phil and our tutor Paul went to go try secure some potential venues for showcasing our work. This would test once again myself and Phil on our professionalism and communication skills. We initially talked to the Transport Museum in which we had to fill out a form to send to the governing board to approve. Moving on it was now open to us to try secure venues, we managed to get Fanthorpes on silver street and prospect centre as definates, then kapow, princes quay, st stephens, ferens art gallery as possibilities. Unfortunately a few no’s came with asking from shops like granger games and thats entertainment but we still tried, rejection is all part of it you dont get if you dont ask. Then on Thursday we showcased our work for the client. My work involved completion of buildings on Trinity House Lane which were Wetherspoons, trinity market entrance, bob carvers, and Davids handed over building which is currently a coffee shop called Coco’s. I will now go through my building to their current stage from what I did in my presentation in a briefer form with a self evaluation for each. These photos were taken by James Branson (his blog) when we all went out taking photographs in the early stages of the project. This is my model of the current Wetherspoons (we are unsure on the original building so may take artistic license to leave it as a pub until we find more). This building has taken me around 3 weeks with working on other things at the same time, as its a highly detailed building I think this is an acceptable time. I have put this down as finished ready to be handed over to the texture team and then to go in engine, the model itself could do with some time taken on optimisation but due to the upcoming deadline my time is better placed elsewhere as the optimisation wont effect us hardly at all and if needs be the texture team can go in to the model and delete loops or polygons to support the unwrapping. The building itself is 21,888 poly’s which with the fine details and complexity of certain features in the building I feel it is a realistic poly count. Issues I came across whilst modelling this was correctly scaling the sections of the building as it seems to be sectioned by ledges, putting the ledge in the right place so that all the window frames, pillars and so on was also to scale was key to the building looking correct. This took tweaking but im pleased with the end product and proportions of the build. The development in my modularity has aided me well in this particular building as extruding pieces like the window-frames, pillars, chimneys, lights etc was the same and only minor edits to the curvature on some parts was needed allowing quick development when adding a feature such as a window-frame. Overall being a later building in the year I feel my 3D skillset had progressed massively in comparison to initial buildings in terms of quality and speed, if any problems arise im confident enough now to quickly amend any issues. This building is the entrance to trinity market, a fairly simple building that didn’t take me very long, as soon as Wetherspoons was complete the building speed increased rapidly. This building I have had to make sure it matches correctly with wetherspoons, i found the modelling of a section of a street so building sections together was far more effective as scale and alignment was much easier to achieve than when your working alongside another person and having to make changes once you realise in engine its slightly out. The building itself I found fairly easy as once again its a later building in my year and I feel more advanced in my 3D work. the only issues was to how to make the extruding shape around the first window in the lowest possible form, which i realise would be as a separate pushed in object to the shape rather than modeled in around the window. Generally the building was simple just swift loops for the windows of the building and door, then everything else modeled separately and snapped to the building facure. Another building im pleased with, finished and ready to hand over to texture and then go into engine. Only addition would be needed if texture team agreed would be the slight fence style look above the door which I thought could be done with a plane that they can make a alpha map to create the fence then a normal to make it pop. Thats only addition needed to this building I believe. This building is currently Bob Carvers on Trinity House Lane. With this model once again the 3D capabilities are there too do buildings like this with good speed and quality at a good optimised level of poly’s. Not many problems came up, due to this i decided on certain windows when we walk past are sometimes open, all i had to do was select the window poly’s detach them from the building then rotated them slightly to give the impression that the windows are open. The group gave me great feedback on this saying they loved the idea and it makes the building looked alot more used and lived in even just with the simple open window rather than a plain shop facure. Again it was just getting the proportions of the building right in relation to my other models and using gathered photography this was made alot easier. I think of all my buildings I like this the most purely because of the windows, it just makes everything look more real and alive. Obviously I will need to make a simple box to simulate a interior as the windows are open and if a player angles it right they will currently be able to see the sky so a simple box interior will solve that problem. This building is currently a coffee shop called Coco’s, this was originally another students building (David) but he handed it over to me for optimisation and the addition of an interior. I had decreased the poly count from just over 1000 to 238 and that was with adding an interior with shop window showcase area. Being a very simple building I dont really have much to give feedback on, its a basic building which took no more than 30 minutes to optimise then add the interior section using simple edge modelling workflow to then bridge the gaps. I did notice one issue, nothing major but pointed out in the presentation id overlooked the way it had been done at the front with the windows, and this results in N-gons in the gaps either side and between the windows. Simple fix with connect or cut tool. All of these buildings are now ready to be handed over to the texture team. 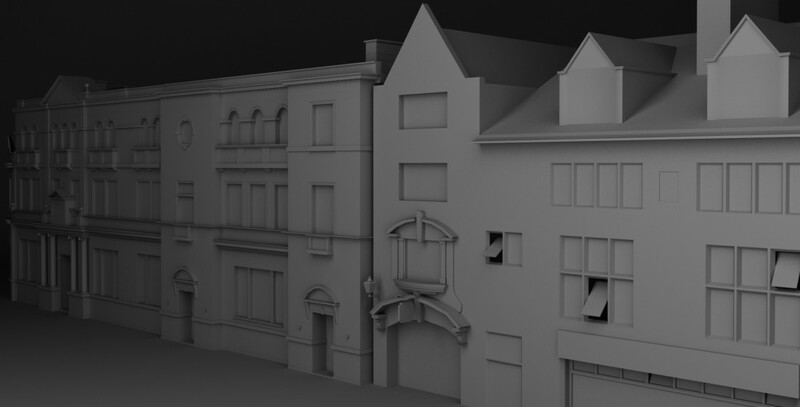 I found that modelling a street section was far more productive and beneficial for myself as a 3D modeler. This was because mainly the dimensions, scale and proportions of buildings, I could use the other buildings i had completed and finished to adjust the new ones to make sure the street looked correct. This worked both ways as any misjudged dimensions could be effectively grabbed and moved into place. Then for Silver Street I have finished RBS and started the silver street entrance to trinity market. This is currently RBS bank building on Silver Street. Once again a very basic building wasn’t much to it just a few insets for windows after I had added loops to extrude some ledges. Because of the simplicity of the building I added a small shop window interior so that there is potential to turn it into a shop if we find out the original status of the building and if we don’t then an artistic decision will be made to adapt the building to possible a bakery for example. And finally from the buildings i presented was the beginning of the silver street entrance to trinity market. This is a fairly complex but also modular building for frames and decorations, then a symmetry modifier applied will allow me to easily check the finished building as its only sensible for speed to model half the building if its complex when symmetry can do the work for you on the other side. This building is currently stalled, this is due to the final hand ins coming to a close we have decided for hand in and the public we have to focus on the texturing of Whitefriargate and Parliament Street, all other buildings will be put in with the basic grey block in the background to suggest that the area is under construction and will be completed for main showcase in September. After we had presented I took the role off Abbiella to create a professional email so that we could email the clients that we had and hadn’t discussed potential showcasing for the project with. This required me to type 2 emails, both similar but adjusted for seen and unseen clients. Once typed it up I asked my tutor Gareth to have a proof check to see if anything could be improved or any key information had been missed. The final email also had a link to our latest video fly through of the project so that the clients could have a quick taster to what we had been working on and will be showcasing. This is also the grey block video fly through we showed our client John Netherwood when he came in. I disclosed that this is not the final product but an in progress project we gain alot of benefits from public showcasing for our marks and the projects quality. This final email was sent to Fanthorpes, St Stephens, Prospect Centre and Princes Quay. After waiting a few days I had successful replies from St Stephens and Fanthorpes confirming interest in allowing us showcasing our work. Fanthorpes was already secured from speaking to the shop manager originally but St Stephens was a fresh attempt of securing a client by myself. Since then myself and St Stephens have been in contact discussing the project and when we would like to showcase it. Coinciding with there times and available for displaying space, I managed to get us a showcasing date before our hand in (19th May) which is Friday 15th May. This required us to have a Public liability insurance cover which initially i didn’t know if we have but with contacting my tutors we do have a copy to send to St Stephens and prepare for Friday. Our location is just outside the elevator near the bagel food vendor stall, next week I will discuss with the group on shifts for the showcase as I personally would like people to man the project in-case any of the public wish to stop and talk to us about what we are doing. A slight issue with St Stephens arose with my tutor Gareth with that it is the shopping centre/ area that has crushed the Whitefriargate area for business and popularity. So when we showcase there as long as we are displaying it as a student project following on from the previous years of the heritage project and our area is a section of Old Town including Whitefriargate, it can be clearly seen as a project rebuilding an area of Hull in the 1960’s and not a display to support Whitefriargate. This turned a few of the group off as they don’t really want any hassle from the public but at the end of the day its an opportunity to showcase our work that i have secured before hand in so participating in it will add to our professionalism and “getting our work out there” for feedback/review. Will this just around the corner next weeks focus as that is also the session all the texture team should have the Whitefriargate and Parliament Street area textured, so the focus will be on promotional materials for our project. Any promotional materials we have can be a extra visual for the project for the public to have, which will aid them in understanding the project and what we do to make it what it is. Categories: Client Project, Year 2 | Tags: 1960s, 3D, 3D Model, art, Autodesk 3ds Max, Buildings, Client, Design, Design Process, Environment, Event, Heritage Hull 1960s, Models, Old Town Memories, Professionalism, progress, Project, Public, Showcase, Video game, youtube | Permalink. 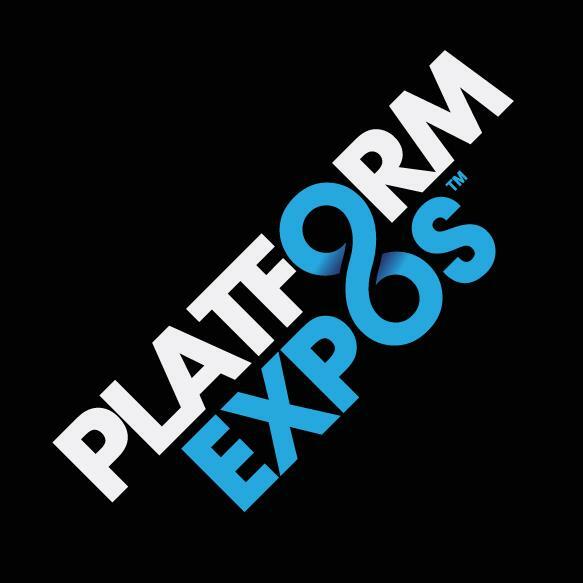 Around 4 weeks ago Myself, Phil Maclennan, Matt Lane, James Cook and Ryan Glover decided we was going to make a game for platform expos and hopefully display it. The idea behind the game was a small car racing game set in a toy workshop that you would race with your friends (up to 4 player) to stay on the track any way possible. If you was too slow the screen would eliminate you, or if you fell off the track you would also be eliminated until only 1 remained who gained the point respawning all 4 back into the race. It was inspired from a game called micro machines, just simple fun yet still competitive. After pinning down the name to Rush n Crush we began using unreal engine 4 to work out the blueprints for the style of game we wanted to make. This was all down to James he is the blueprint expert out of the team, the rest of us are the 3d artists of the game we began to model our cars which were a mustang for me, a f1 car for ryan, a truck for phil and a rc car for matt. Unfortunately we didnt get chance to use our custom cars in the demo of the game at platform and instead used buggies with different emissive colours to represent the players. The cars however was placed around the track to make it feel like the workshop owner had built them so they wasnt wasted models. As you can see with the amount of poly’s i used (6998) im really pleased with the outcome of my mustang. It took about 2 weeks on and off working on it but im still pleased with the outcome. i added a few progress pictures in there too so you can see how much it came on and what i added, most details are not nessacery due to the style of the game being top down and relatively far away with small cars so i was able to cut some corners on certain parts of the car, the white car is the finished textured mustang which would have gone in game time permitted but will be rigged and put into the game in the near future. Then with all our actual course demands like client projects and self initiated we didnt do much until the final week where our tutors allowed us to be taken off lesson timetable on wednesday and thursday to push to get the game working and looking good. So we did long days of modelling, texturing, and testing to get a game we wanted to show to the people attending platform. Looking back if we had managed to free ourselves the time alongside our course work the game could have been alot further along. Fairly extensive as you can see, we priotitised thing we felt needed to be in the game and then the rest was just extras to block out the level. Additions to this list was made along the way and some of this list was modelled and not used, its still all work taking into consideration what could work in the environment to make a decision whether or not we felt it played a part in the design well enough. Then it was down to the placement of the models to make a track ill go further into this later on. Personally i did 21 models, not all ended up featured in the platform demo of the game and not all of the asset list was even modelled. for example the rocket projectile, speed boost and sweet were meant to be power ups along the track but we wasnt able to figure out how they would work in time so they are on standby for future additions to the game. Im happy with my work that i produced, the majority of this minus the mustang was done in the last 2 days before platform as we all needed to go full steam ahead to having something presentable to the public, some models are rather low poly like the drill its very box like but that was due to the game we had room to cut down and wanted not to go too mad on polycount just so it ran smoothly. My texturing ability is one i need to brush up on but doing this work has really made it come on i now know what im doing better and produced some nice final products especially the toolbench i was particulary pleased with that, the bin bags i used mudbox to sculpt a normal map to bake into the model, and the paper i photoshopped to create an alpha map showing i can used other texture maps to improve my model texture. I am looking forward to doing this all over again for a new level as it really benifitted my modelling work speed, work quality, and texturing. Cars currently being my best asset of modelling (see classic mini) modelling other simple realistic assets will be beneficial to alternate projects such as the client project. The logo was done by myself, i am no illustrator but it did the job for the day it will need revisiting for a final product to add professionalism but for the time it worked. I used a impact font to give a bold clear type to the logo, then sketches of 2 of the cars in relation to speed and damage added speed lines to the rush to symbolise movement then a expolsion and crushed together font for the crush type. Then just a simple emboss and border to make it all pop. With everything set and filled out in the environment we was ready for platform the next morning to get some people testing our game. These lads age range 20-25 clearly enjoyed the simple re-playability aspect of the game, one of them gave our game a 9/10 with only feedback of custom cars and more tracks. So despite being a game you can relate to a younger market it clearly appeals to all ages who enjoy some quick easy to pick up racing fun. This video is of some younger lads who were on a school trip having a race and enjoying it, the particular thing in this video is the ease of pick up and play. One lad had been playing for a while had enough decided to move on and his friend close by just picks the controller up to race. That is exactly what we was going for, in one case some were like “I’m alright ill just watch” but as soon as they picked up gave it a go they loved it i think it surprised a few how much fun it was. My favourite video being this one, a group of school trip lads again playing the game (younger audience target market seems likely) i have managed to get an angle of them in shot and the screen so you can see the reactions, its all smiles, reactions and enjoyment. One lad once again stating “i would buy this game” which we heard alot throughout the day especially from console players. A unintended feature of the video was the reflection from the TV but it does catch some reactions whilst playing so it sort of work, next time we would rather have screen capture software for clear game play and then a webcam on top to monitor people playing. Then the final video is myself playing with another group of lads (we had alot of girls playing too one said she preferred it to micro machines in guild hall but didnt get any footage) im the red car and get wiped out completely by one of them straight away which i wasnt happy about. Throughout the day i played with most people just getting to know their feedback if they liked the game how they was enjoying it and if they would like to see it move on, this usually ended up in great feedback and then them all teaming up on me to ram me off as I am one of the game developers (i knew the shortcuts…or they refer to as cheating). It was great fun enjoying the game with other people of all ages, seeing how they reacted and making them feel free to express hatred towards me when i kept winning. You can see the pure enjoyment which is exactly what we was going for something thats not overcomplicated there isnt too much going on its just pure racing against your friends and the track to win any way you can which i feel we achieved. Throughout the day we had lots of people expressing their interest in the game and how they want to see it released. This got us thinking how can we do this, as we are students the software we use is under student licensing which means we cannot sell anything that we produce in the software we use. Speaking to a few fellow developers they suggested using blender for our models (but that means re-modelling everything in a brand new program we need to learn) or kickstarter which is an organisation that allows people to gain funding for a project through the public using a kickstarter campaign. Kickstarter seemed like the most likely until I was approached by a guy from microsoft who said to me that we should get it on steam, once i mentioned student licenses and where we was from being Hull school of art and design being game artists using unreal engine 4s blueprints he gave me his business card for me to contact him about our game and how we can make the next step. He briefly mentioned personally reaching out to the likes of autodesk and unreal to give us free licensing as good publicity on their behalf which is another option but microsofts interest was certainly a shock expressing how much he loves what we have done with the game. We have a few options but hopefully we will get the game finished and on sale to the public. We had interest from Smashed Crab studios who are a team of programmers that was interested in helping us take the game further using programming, this is something to consider as we are no programmers we just make everything look nice and we did make it work to a re-playable extent. And then a guy who is building up his portfolio for sound said he would love to work for us on a free basis as long as he can display the game in his portfolio piece, which was great as we have no sounds so its definately something we will consider taking up. I personally left friday thinking to myself this is amazing, i couldnt believe how well recieved the game was and the amount of interest in its release. Telling people we couldnt release yet due to being students wasnt what we wanted to say and now we want to turn the table to say yes it will be out. This has a potential not only as a game but us 5 as a team to go far as we showed how capable we are with plenty of room to move forward. Features was suggested to us by varied people throughout platform, things such as different/ custom cars was a popular one (already have) aswell as new tracks. Gameplay we have thought about all the time, from a kitchen scene where plates in the sink are balance your way across to a games room with a scaletrix track on the go. 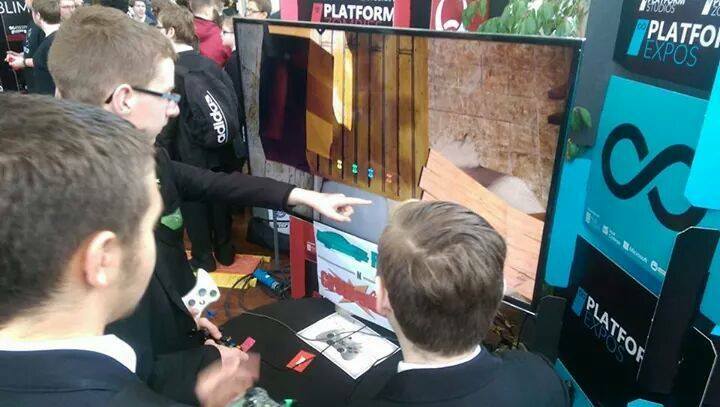 Overall this was a extremely valuable experience for us 5 even if the game doesnt go anywhere we can say we built a game and displayed it at a gaming expo where it was a hit with most, one group of lads was on it for a good 3hours laughing, ramming and replaying. If all funding doesnt work we can still release it for free and have a shipped game behind us. We are definately going to proceed with working on the game to getting a finished product we can hopefully sell, who knows the game could be a hit starting us as a indie studio in hull. What platform is all about is bringing the gaming industry to Hull, its not as well developed in games design as many other places in the UK so with the city of culture coming up now is the time to thrive and push to making Hull a contributing city to the gaming industry. Thats what platform does it gives small teams like ourselves to display our game to get it out there to the public for feedback and testing, its great for marketing. Calender did a bit of footage of the day reporting on what platform is http://www.itv.com/news/calendar/update/2014-11-14/hull-becoming-major-player-in-computer-gaming/ We are extremely grateful to platform for allowing us this opportunity to display our game, hopefully next year we can come back with the finished product. Keep watch on us there will be more from us and Rush n Crush. if you need to contact us please email us or post to facebook. Categories: Personal, Year 2 | Tags: 3D, Brand, Design, Event, feedback, Gameplay, Platform Expos, progress, Racing, Rush n Crush, Video game | Permalink. 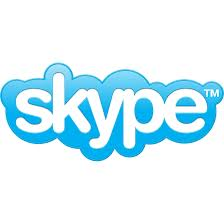 Skype- My week of Skyping into lessons. From Friday 22nd November until Friday 29th November I spent the week in my house under doctors orders due to tissue damage in my knee. But the main argument with my doctor was I don’t want to miss my college work or fall behind as I want to be as successful as possible in my course. After much debate he told me I had no option the more I walked on my knee the worse it would get and the more permanent the damage might be. Luckily for me Phillip Maclennan owned an iPad with Skype on it as we had skyped a few times previously when playing on the PlayStation, the idea I had was that if Phil was ok with it and the teachers was ok I could use his iPad to Skype into lessons so therefore I wasn’t missing out on anything by using Skype’s free video call (webcam) feature. This was a success everyone was ok with it and I continued work as normal (well my head on a screen being carried around) my tutor Gareth was particularly impressed and told me so when I returned in my 1 on 1 tutorial. “That initiative and thought to not miss a lesson even if you are unable to come in is exactly the right attitude as it shows you want to be here”- Gareth’s words to me. This pleased me very much as that’s exactly the impression I wanted to get across, Gareth actually video recorded me at one point on my first Skype lesson as he wanted to show people it as I imagine it’s not been done before. A few people laughed and was quite fascinated by the idea but warmed to the idea and considered doing it themselves if in a situation like mine. On occasion at lunch times I turned my camera around and some classmates watch me play Crash Bandicoot on my PlayStation to keep them entertained, or put myself in Rome in relevance to my adaptation lesson using dell’s webcam central control. Although there was sound problems and picture pixilation’s on occasion I still managed throughout the week to keep up and be involved in the lessons activities, even the 3ds max lesson which I struggled a little on due to the sound going and me missing a step but Phil and Paul assisted me back on track and I did complete it. So if in this situation again (hopefully not) I will be sure to do it again. Massive thanks to Phil for letting me use his iPad to see the lesson (also carry me round and rotate me for viewing purposes). I will try get the video/pictures off Gareth to show you what it looked like for everyone. Categories: Events, Main Blog, Research | Tags: Event, PHASEgaming, Skype | Permalink.